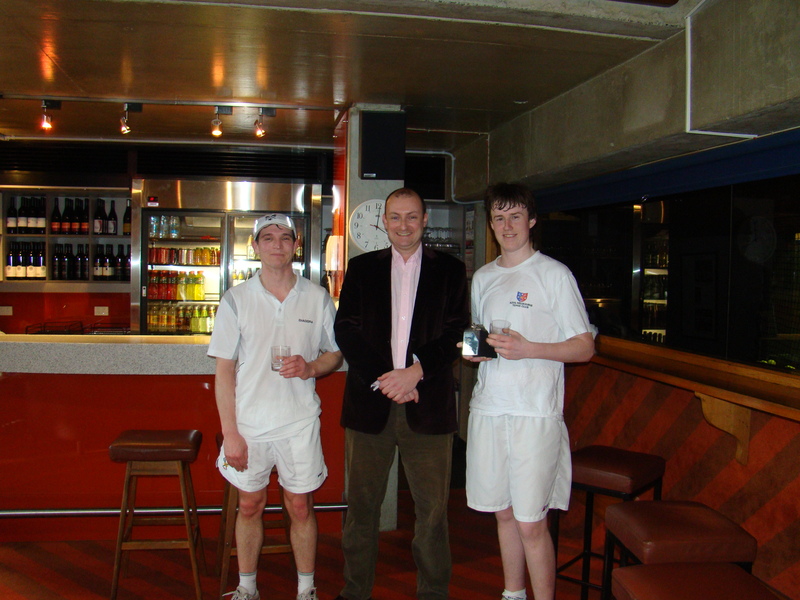 The third Quarterly Medal for 2010 was held at the Club last Saturday. A full field of 20 participants competed in the morning and afternoon sessions, with some great tennis being played and close matches being fought. Diane Rennard and a left-handed Brendan O’Brien were victorious in the morning, whilst Will Fowles and Alistair Hill triumphed in the afternoon. Diane, Brendan, Will and Alistair are now eligible to compete in the Medal of Medallists competition on Finals Day in December. The final Quarterly Medal for 2010 will be held on 16 October – make sure it’s in your diary! Last weekend a group of us went down to Hobart to play the President’s Cup and otherwise enjoy the Hobart Real Tennis Club. We played 12 matches on the Saturday and another 5 on Sunday and I am very pleased to be able to say that the RMTC were victorious by 11 rubbers to 6. Our team consisted of Richard Simpson, Richard Travers, Jeremy and Evelyn Howard, Tim Hurburgh, Paul Wheeler, Henry Turnbull, Iain Buchanan, Anabelle Guest and me with everyone enjoying at least one win. It was very nice to be accompanied by Isabelle Hurburgh, Libby Simpson, Denise Barratt, Helen Wheeler and Caroline Travers. Everyone had a few highlights but particular mentions go to Richard Simpson for his main wall winning gallery shot, Jeremy Howard for anchoring 3 matches with his wrong hand and to Evelyn Howard who was clearly best-on-court in each match she played. It wasn’t all hard work for the team. On Saturday night we enjoyed what was an important night for the HRTC as we honoured Andrew Kemp in what was a celebration of his becoming an Honorary Life Member of the club. During the evening the past Presidents of the two clubs were asked to tell a story of their most embarrassing moments during their term. Amusing anecdotes were heard from Paul Wheeler, George Casimaty and Warren Boyles. Henry Turnbull claimed that his term was completely without incident but it was Richard Travers who won the Champagne for asking a man, who was playing tennis with a young girl he didn’t recognise, the name of his daughter only to be told that she was his second wife! Alistair Curley gave a wonderful speech about Andrew Kemp and then Andrew spoke to his heart’s content ignoring first his wife and then his own wise words to keep it short. At one point he said he would like to finish with his regrets of which he had NONE – he then went to sit down before bouncing back up to continue for another 5 minutes. It was all good fun. Andrew is the patron of the HRTC and on behalf of everyone at the RMTC we’d like to thank him for everything he’s done for the club in making it the generous and hospitable club that it is that so many of us have enjoyed visiting over the years. We would also like to thank John Ramsay (HRTC President) and Barry Toates for hosting and arranging a great weekend and to anyone heading down that way I recommend Sunday lunch at the Meadowbank vineyard on the way to the airport. This year’s Richmond Silver Racket (which is open to the top 16 players by handicap) was played over the weekend with players handicaps ranging from 12 to 34. There were a number of good performances including Nick Shelton’s back-to-back 3 set wins against first Jon Hamer and then Alistair Hill. However, in the top half of the draw it was Graeme Blundstone of the HRTC who starred defeating along the way Owen Guest and Andrew Gould before defeating Nick in the semi-final 6/3 6/2. In the bottom half of the draw Dan Williams did well to make the semi-final before he fell victim to James Gould 6/3 6/5. The final was played with Graeme (22.3) giving James (24.9) Rec ½ 15. James played his ever improving left handed combination of rangy stroke play and youthful abandon and Graeme, who looks like an accomplished lawn tennis player, ran and retrieved like Georgie Lewis’s most recently adopted canine. It took James about an hour to defend the honour of the RMTC as he completed his victory 6/5 6/4 and once again it was his left handed railroad that gave him his edge. The only disappointing aspect of the event was that the club’s leading players did not take part.